The Tomko Dental Associates team is proud to offer a wide range of dental services to seamlessly repair smiles, but we’d much rather work with patients to prevent dental decay and damage from ever occurring. That’s why we encourage patients to maintain an ongoing preventive dentistry plan that includes visiting our Allentown dental practice two times each year. If it’s been six months or longer since your last trip to your family dentist, we invite you to contact our team to schedule an appointment today. We accept patients from Fogelsville and other nearby communities as well. We pride ourselves on partnering with patients to create a personalized oral health care plan that meets their unique needs, but every patient should visit our office at least two times each year for dental checkups and professional teeth cleanings. These six month appointments allow our dentist and team to evaluate smiles for signs of common oral health concerns, answer patient questions, recommend improvements or changes to at-home care, and continue to build a lasting relationship based on trust and respect. Unconscious grinding or clenching of teeth, bruxism, may be caused by a number of things including stress, misaligned bite, and habit. Bruxism most commonly occurs while patients are sleeping making it a difficult habit to break. We recommend custom crafted oral appliances to prevent potential dental damage that may occur due to bruxism. These custom nightguards position the jaw in its ideal location, reducing the amount of grinding and clenching that occurs, and places a physical barrier between teeth to prevent dental chips and wear. Sports related injuries are the leading causes of tooth loss for patients under the age of 25, and more than half of all sports injuries involve the face. The best way for patients to protect smiles from potential damage is to wear a sportsguard anytime they compete in athletic events where teeth may come in contact with other players, sports equipment, or hard surfaces. 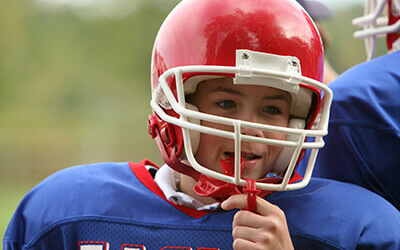 We offer comfortable, custom sportsguards that protect smiles without the bulky feeling and discomfort that often occurs when patients wear store bought athletic mouthguards. According to research conducted by the Oral Cancer Foundation, early diagnosis is the best way to decrease the annual number of oral cancer related deaths. With this disease claiming the life of one person each our on average in the US alone, it’s essential that dentists and physicians do their part to screen for early warning signs of this disease. We use the Identafi oral cancer screening system to diagnose oral cancer in the earliest stages increasing patients’ odds of making a full recovery. 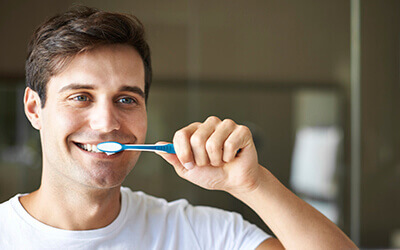 Ingested fluoride found in water and other sources is essential to the development of strong, healthy tooth enamel, but once teeth erupt from the gum line, topical fluoride is necessary to keep these teeth strong and healthy. For most patients, adequate fluoride is present in toothpastes and mouthwashes, but for young patients who are still developing their oral hygiene routines and adults who are prone to decay, we may recommend professional topical fluoride treatments to strengthen enamel and reduce the risk for tooth decay.